This is page for the latest scripture challenge at Faith Sisters. 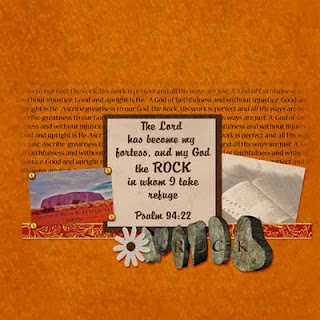 We were given the word "ROCK" being an attribute of God. The photo I used on my little 6 x6 page is of Ayers Rock ( that was its name when I saw it ) now known as Uluru. This was back in 1975 when I went on a bus camping trip around Australia. I actually did climb the rock. I think nowadays tourists are not allowed to climb to the top. I used to have a T Shirt saying "I Climbed Ayers Rock".